This weekend’s exercise addresses issues of particular concern to older adults: balance and cognitive health. The Trip And Fall Averter works muscles that are associated with balance, particularly muscle groups in the legs. This forms muscle memory that helps keep you upright when you react to a loss of balance. As you improve your balance with exercises like this one, you’ll also be improving your brain health. A compelling study shows that balance and cognitive health are connected, and how improving one results in improvement in the other. And it gets better. Yet another study confirms it’s never too late to start making positive changes to your physical and mental health. Many muscles are involved in keeping you upright and maintaining balance. They work together to promote strength, flexibility, and stability. If some are weaker than others, then there is imbalance, setting the stage for a fall. Today’s exercise primarily works the muscles in the buttocks and legs that are associated with balance and that tend to be neglected in the average workout. Also, your arms will be doing something completely different, making this a mental challenge as well. And that is good for your brain and coordination. The gluteus medius is often overshadowed by the gluteus maximus, but it’s actually very pivotal in balance. When you’re standing on one leg, the gluteus medius stabilizes your hip and leg. You use this muscle each time you lift your leg out from your body. If you put one hand on your hip (the top bone of the pelvis) and the other on the ball-and-socket joint on the same side, you can feel the gluteus medius contract when you lift your leg outward. Even though it is relatively short in length, the gluteus medius helps stabilize the knee as well. The soleus is another important balance muscle. It’s one of the calf muscles, running from the back of the knee to the ankle and attaching via the Achilles tendon. This muscle stabilizes and supports the knee, preventing falls by strengthening this crucial joint. The hamstrings come into play in this exercise. These muscles run along the backs of your thighs, and you use them each time you bend your knees. Hamstrings are the prime muscles used to bring you down into a lunge (and up again). Of course, the hamstrings are also crucial for maintaining balance. There’s another purpose to working these muscles. In addition to promoting skeletal stability and balance, exercise builds bone by stimulating the areas of the skeleton to which they attach. This is Wolff’s Law, a principle which Savers are familiar with. The concept of Wolff’s Law is that bone responds to stress and pressure from gravity and muscles by becoming stronger. In this way, exercise stimulates bone growth and increases density. The Trip And Fall Averter takes a bit of coordination, so if you’re uncertain about your balance, you might prefer to stand near a bed or wall as you get the hang of it. Feel free to go very slowly at first, and don’t forget to have fun learning the moves! As you get proficient at this exercise, you can add in hand-held weights (or water bottles), or wrist weights to work the arms, too. As you lift your right foot, touch your left hand to your left shoulder and your right hand to your right hip. Now lift your left foot in the same way, and switch hands (right hand on your shoulder and left hand on your hip). Continuing the stepping pattern, start lifting each foot two times in a row before switching to the other while still switching the hands on the shoulders and hips. In other words, the hand and arm pattern does not change, but the foot-lifting does. Continue the second phase for about one minute, or whatever is comfortable for you. It’s a bit challenging, isn’t it? I know I had to stop and think about what I was doing several times while performing this exercise! But that’s actually a tremendous benefit, as the study we’ll discuss next shows. Clearly, fall risk and brain health are closely connected, and as one declines, so does the other. The opposite, then, must be true – decreasing fall risk can boost your brain health and increasing your brain health can reduce fall risk, a dual benefit that is accomplished via regular exercise. Study Shows It’s Never Too Late To Get Started! The issue of it being “too late” to build bones and improve health is often addressed in our communications with Savers. Simply put, it isn’t too late; a healthful lifestyle is always beneficial, regardless of age. All it takes is to get started exercising, a simple point that a recent study makes clear beyond doubt. This study involved three groups of participants who ranged in age from 62 to 84. Two groups engaged in an intense aerobics program that included strength training, while the third group performed exercises that were like those you can easily do at home – balance and coordination moves, flexibility exercises, and even ball games. All three groups experienced “equivalent improvement in cognitive performance,”2 making the point that you don’t have to join an aerobics class to benefit from exercise. You can start by just doing an activity you enjoy. How refreshing! The Densercise™ Epidensity Training System can help you reach this goal. 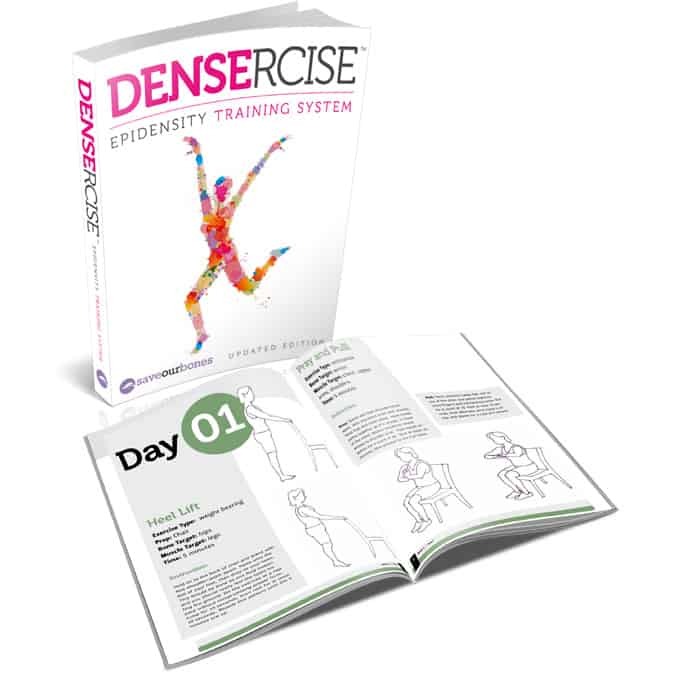 Like the exercises performed by the third group in the study above, the moves in Densercise™ can easily be done at home. No special equipment is required, and you don’t need a gym membership. You can schedule your Densercise™ sessions as soon as you get up in the morning, right in your bedroom. Or you can “Densercise” in the afternoon as an energizing pick-me-up. Whether indoors or out, Densercise™ is compatible with all kinds of locations and schedules. And it takes just 15 minutes a day, three times a week. It really is that simple. Just make the decision to get moving today! Just a suggestion. Why not give your customers the option of getting actual books instead of the PDF files? Most of us would be willing to pay the extra charge to have printed copis of your programs. Thanks for your informative information! Would it be possible for your 52 exercises to be put on a DVD? Downloading a book would cost a lot in ink and video players are not used anymore. Vivian. It seems easy but, it needs concentration. I was diagnosed with osteoporosis seven years ago after a bone scan and following extensive research into bisphosphanates decided against taking them despite huge pressure from medics here in London. Instead I made some lifestyle changes – gave up smoking, took vitamin D, limited alcohol and improved my diet. Just had the results of a new bone scan and there has been no bone loss since my last scan five years ago. What a success story! You made very simple, practical choices that had a positive effect on your bone health. Good for you!